Hey... I think she grew a little bit taller! Synopsis: This is a two-part chapter. In the first part, A-tan explains how the Royal Garden works to Mikado using varied illustrations that range from Amateurish to semi-pro level. She even draws a shoujo manga version of herself escaping the place. Basically, the Royal Garden is a seal created by King Midas for his power so that even if power comes out of the garden, it automatically returns to it. However, ten years ago, the Shirozakura, which was one of the garden's largest sources of power was taken out when she escaped -- which is why the Royal Garden just has about four months left until it is destroyed and the Royal Power is unleashed upon the world. With her explanation complete, she makes a standing offer to Mikado to negotiate with her if he wants another King's Jewel. Athena is 100% better as a character with her memories back while still in Alice form. The second part is about Nagi leaving the Violet Mansion. All the tenants are present and are taken aback by her announcement that she would be going back to her original mansion. Hinagiku notes that it's going to be lonely and the hamster suggests having a farewell party, but Nagi refuses since she says that it's not like they won't see each other again, they just won't be living together from now on. With that, she takes Hayate and Maria and leaves for the Sanzen'in Mansion. A-tan reminds me of a cross between Tohsaka Rin from Fate/Stay Night and Kuchiki Rukia from Bleach here. Once they are back at the mansion, Nagi herself is impressed by just how majestic the place is. She jumps onto her bed and then gets up and immediately goes for her PS5 on a huge HD Screen! 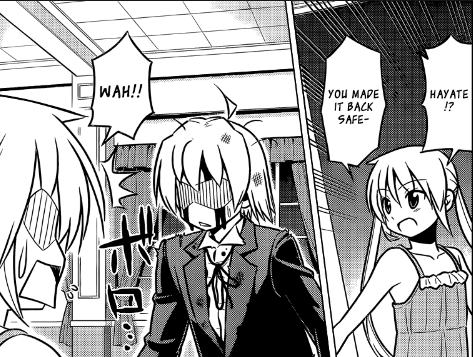 Hayate tells her not to overdo it and takes his leave to help out Maria. Left alone, Nagi appears to be overjoyed now that she's able to play games on an HD screen once again, but with every action that she takes in the game, she remembers bits and pieces of her life in the Violet Mansion together with the others. The chapter ends at this point. Shut up, fool! 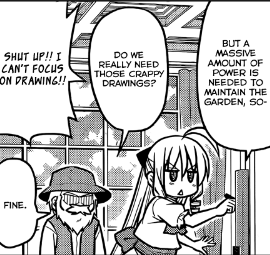 Athena-chan is drawing. Review: Naturally, I love every Nagi chapter. In fact, any story with tons of Nagi is a good one! (see here, if you don't get the reference :)) I do mean it, though. You have an effin PS5, Nagi! Stay true to your otaku roots! You need no friends! Haha! Just kidding, of course. Athena really is all about the plot and we finally get confirmation here that she does indeed have her memories back in chibi form. She even refers to herself as "Athena-chan" in her drawings. 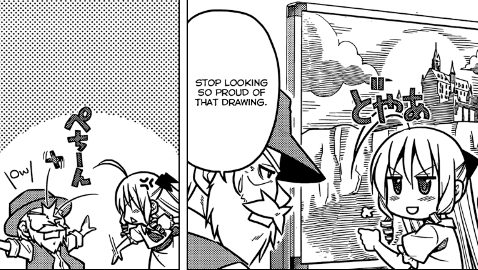 The illustrations were pretty funny, especially the varying levels of effort that she puts into each drawing and her Kuchiki Rukia-like expressions looking so proud of her artwork. That sparkle! 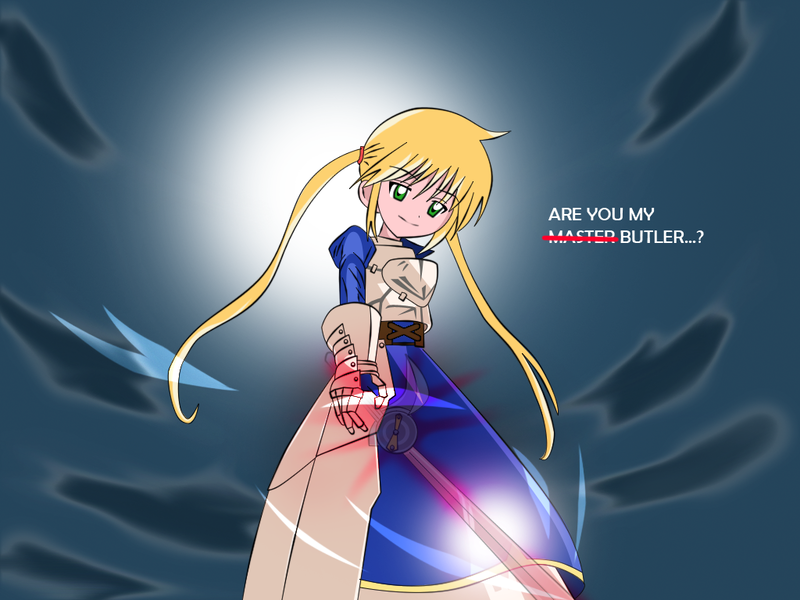 But... authentic shoujo style uses multi-lines, A-tan! 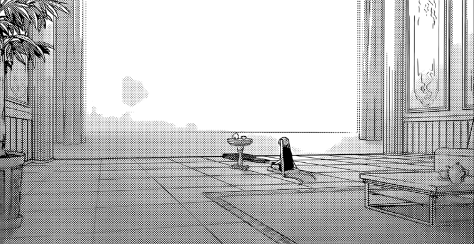 While we apparently had confirmation that Hata was dumping CTMEOY with the appearance of the Kurotsubaki in the previous chapter, it appears that this current chapter actually reinforces its canonicity. It's just circumstantial evidence but remember how in CTMEOY episode 1 (I think) that Chiharu tells Nagi that she already knew what it was like to lose something? Well, this chapter seems to be connected to that moment, which I'll take up in the speculation corner. Nagi: I'm outta here! kthxbai! Anyway, while some individuals might take this opportunity to get dismissive of Nagi's behavior in this chapter and claim that she has once again reverted to her old ways, I wouldn't be so quick to judge based on the last page. I think it's pretty clear that she's just putting up a front... which leads to the speculation corner. Speculation Corner: In ep 1 of CTMEOY, Chiharu tells Nagi that she should already know what it's like to lose something important and Nagi has a panning flashback of the Violet Mansion. I believe that this current chapter is connected to that event in that Nagi will realize just how much she misses her old life with her friends there -- which is why they have that setup in CTMEOY and Cuties wherein she spends the weekends in the Sanzen'in estate, but spends most the weekdays together with everyone else in the Violet Mansion. souvenir and lo and behold! It really is the Kurotsubaki (or Black Camelia if you prefer) because it clearly says so in its case. Anyway, reports back to Nagi, who has just finished watching the final episode of Love Live (I think) in tears. Hayate is a bloody mess, but he is successful in his mission. THIS WATCH! THIS WATCH! THIS WATCH! THIS WATCH! THIS WATCH! THIS WATCH! THIS WATCH! THIS WATCH!THIS WATCH! THIS WATCH! THIS WATCH! THIS WATCH! THIS WATCH! THIS WATCH! THIS WATCH! THIS WATCH! THIS WATCH! THIS WATCH! THIS WATCH! THIS WATCH! THIS WATCH! THIS WATCH! THIS WATCH! THIS WATCH! After Nagi's party leaves, Mikado is confronted by Athena and he tells her that it was all part of his plan to reinstate Nagi as heir and stuff, but as he's playing with his King's Jewel, Isumi makes like a sniper and destroys the King's Jewel from some camping hotspot outside of the castle. Well, in one piece anyway. Review: Well, we've got some major developments here. First off, the clock really is confirmed to be the Kurotsubaki. With that said, I still don't think that's enough to throw CTMEOY out the window just yet. I don't think it even really contradicts the anime because there is still time for the clock to somehow end up in Las Vegas... although the only problem with that is Nagi should recognize the clock when she sees it... still, there are some plothax ways to explain that away. With that said, what really concerns me more is the text at the end that "time advances toward December." Does that mean we're going to get a time skip and move on ahead to the final arc? Actually, it seems this story itself was part of the final arc all along. 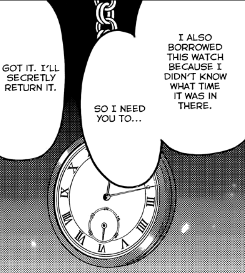 I am also interested in how Shin Hayek will be introduced into this manga since his story of stealing the Kurotsubaki doesn't make sense now that the clock has been shown to still be in Mikado's possession until Hayate took it just now. Gotta love Athena's expression here. Also, it seems that Isumi really has a personal agenda with those King's Jewels with her making like a sniper to destroy them twice in a row now. Athena's "just as planned look" was pretty funny. Over-all, this chapter really did a lot to advance the plot forward. Like, it advanced the plot in one chapter more than the entirety of Ruka's arc did. Still, does this mean that Ruka has been permanently cut out from the manga now since she'll be in her concert tour and away from the rest of the crew? Anyway, we'll see... but I'm not ready to call it quits on CTMEOY just yet until the manga's timeline finally reaches September and totally contradicts it. By the way, the manga is already contradicting itself since Nagi specifically referred to the anime as canon in the first few pages of chapter 400. Go look it up. Speculation corner: Hmm... so, that was probably a mini-arc-ender, so nothing to speculate for now. I'm not really into this King's Jewel plot business, so I'll leave that to the experts on that subject out there. I guess I'll just throw in one thing... Nagi will win anyway! I am now also skeptical about the manga ending in December. I used to think that it would be the perfect way to end this, but with the endgame drawing near and Hayate's promise to Ikusa that they'd be back next summer, I wonder if the manga will actually extend to a second year and a new school term just like the season 1 anime did? 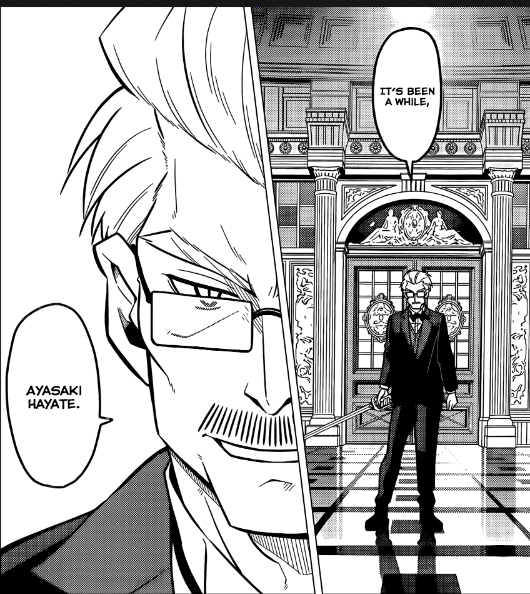 Also, Himegami still hasn't even received any significant role in this manga even though he is supposedly connected with this entire King's Jewel business. Fanart corner: Well now, I just finished this one this week. With the Holy Grail Wars Servant x Master wars looming in the horizon, isn't this quite appropriate? With that said, do you think Nagi can even lift her sword? Now isn't this fanart appropriate for this chapter? Apparently, she's slacking off while waiting for Hayate... that's how much she TRUSTS in him! Radiostar kinda looks like a bishounen here, no? Both are aware that they are running out of time to find Mikado's King's Jewel and escape the dungeon alive...well, Radiostar's already dead but... aaaanyway, they find themselves inside a majestic looking place and Hayate is greeted by a familiar face, Head Butler Klaus and armed with a sword. Hayate asks Klaus what he's doing here and Klaus explains that he works there part-time four days a week, pretty much like Konoha. Klaus attacks Hayate from out of nowhere tells Hayate to take the sword. He states that it's been eight months since Hayate became Nagi's butler but Klaus still hasn't fully accepted him, so it's the perfect time for a showdown. 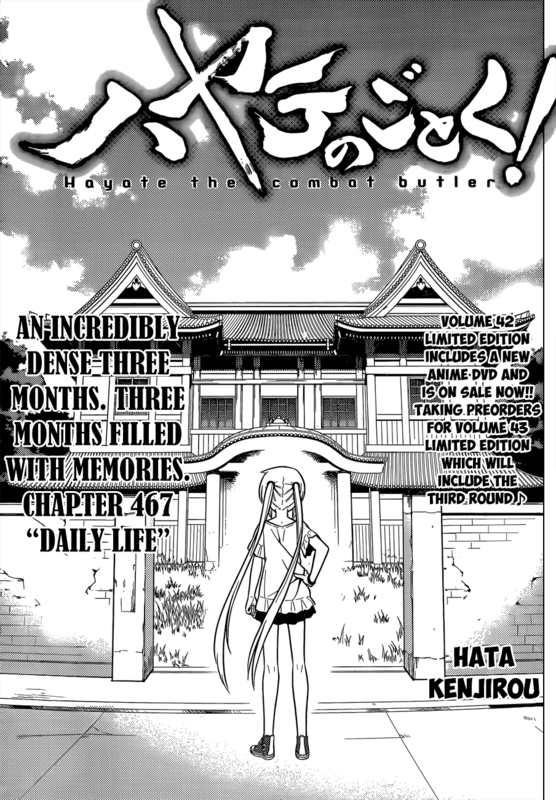 Hayate takes the sword and tries to think of a sentimental memory involving Klaus but comes up with nothing. The two Sanzen'in butlers take their stances and thus begins a duel of epic proportions... or not. 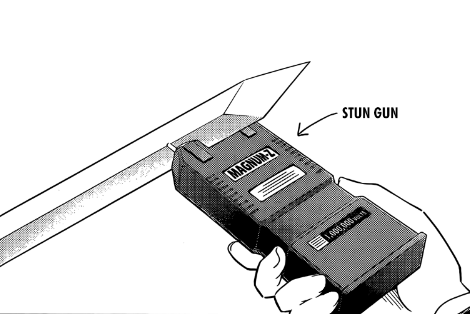 Hayate parries Klaus' blade with presumably the same stungun that Konoha used on his watch and zaps the older man into submission without much effort. With Klaus out of the way, Hayate and Radiostar finally find the King's Jewel inside a glass case. Radiostar wonders how much time they have left and sees what looks like a small pocketwatch and wonders if its time is accurate. The chapter ends here. Review: Gotta love the play of words on the chapter title. Anyway, this was a rather straightforward chapter, but let's not beat around the bush. The question that is on everyone's minds right now would be: "Is that the Black Camelia/Kurotsubaki shown on the last page of this chapter?" It could be... or it might not be. 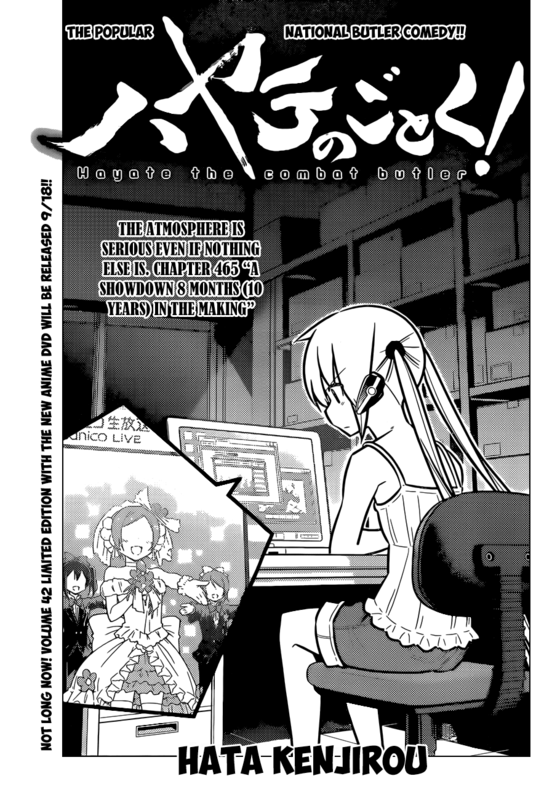 If it is the Kurotsubaki, then it has definite implications on this manga. For one, it could do away with all the developments of Can't Take My Eyes Off You (but probably not Heaven Is A Place On Earth) since the Kurotsubaki was supposed to be in Las Vegas as part of Shin Hayek's possessions. Ladies and gentlemen... it's TIME! 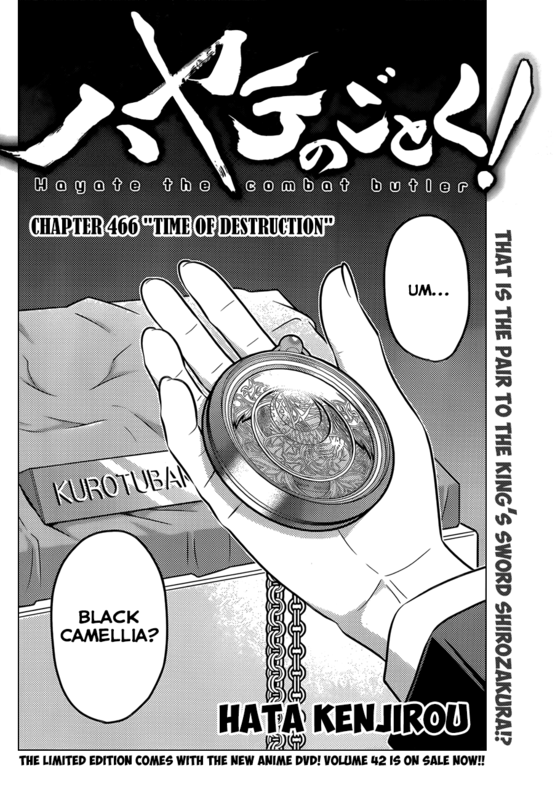 Looking at the clock, it does look similar to the Kurotsubaki, but then again, so does any other pocketwatch. 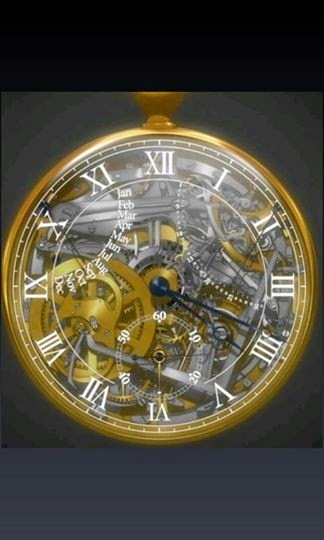 On the other hand, the Kurotsubaki is clearly a transparent pocketwatch, while this one does not seem to be. There's also the month indicator on the Kurotsubaki. Of course, we could just blame that on Hata being too lazy or changes between the anime and manga adaptations. The hands are similarly shaped for both watches as are the Roman Numerals used on the watch face. Is that really the Kurotsubaki? What do you think? So anyway, if the Manga starts taking a different direction from Can't Take My Eyes Off You, then it leaves a lot of room for one more big arc until the finale since the whole of September was supposed to be CTMEOY's timeline. It also screws with all the theories regarding the canon status of the supposedly "future anime timelines." Now this isn't necessarily a bad thing however. Let's face it, as much as I liked the pro-Nagi developments of the future timeline anime, there were tons of plotholes and the entire story itself felt a bit half-baked -- while of course, the finale was still quite satisfying for me. 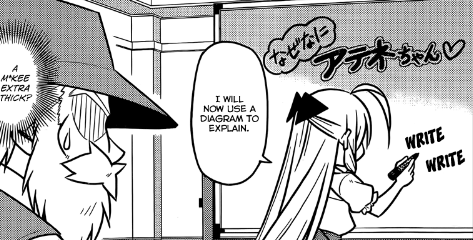 By having the manga take a different direction from the anime, Hata could easily wipe the slate clean, so to speak, and keep the universe of the canon manga free from any of the glaring plot inconsistencies brought about by CTMEOY. On the other hand, while I'm okay with not having Nagi's CTMEOY confession being part of canon (because it's going to happen even more satisfyingly in the manga anyway), it does feel like Hata is taking the lazy man's way out if he does choose to have the manga take a different direction since that pretty much puts CTMEOY in the realm of a non-canon spin-off -- one written by the author himself. Therefore, over-all, while I have mixed feelings about this new "development," I don't exactly hate it. On the bright side, it does leave a lot more room for Hata to work in elements of Can't Take My Eyes Off You's story into the manga and make it even better than what we saw in the anime, but we'll have to wait and see if the speculations about the Kurotsubaki are correct in the succeeding chapters of this manga. Don't blink or you might miss it! This is not an easy "cheap shot" to make. And let me tell you that it's not easy to parry a sword swing with a stungun and have the blade rest accurately between the prongs. You're more likely to get your hand or fingers cut off trying that. 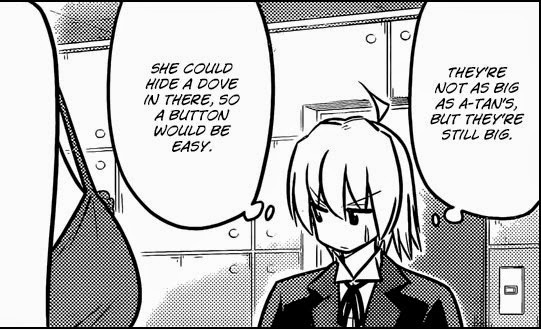 In other words, don't belittle Hayate's accomplishment there. Hata might have made it seem like a cheap shot, but it takes a superhuman level of skill to pull that off in real life... well, I just had to point that out. 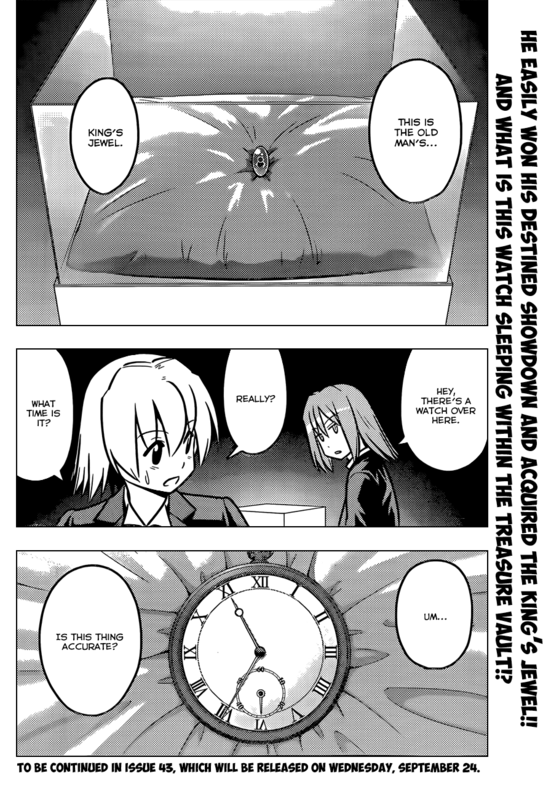 Speculation Corner: Okay, I'm going to say that the pocket watch that Hayate and Radiostar saw is not the Kurotsubaki but another watch with magical powers that is somehow in Mikado's possession. I dunno why... I just have this gut feeling. Fanart Corner: I posted this on twitter and someone immediately got the reference. I tried the same thing on a Facebook Hayate fan page and no one knew where the pose and outfit Nagi's wearing here are from. 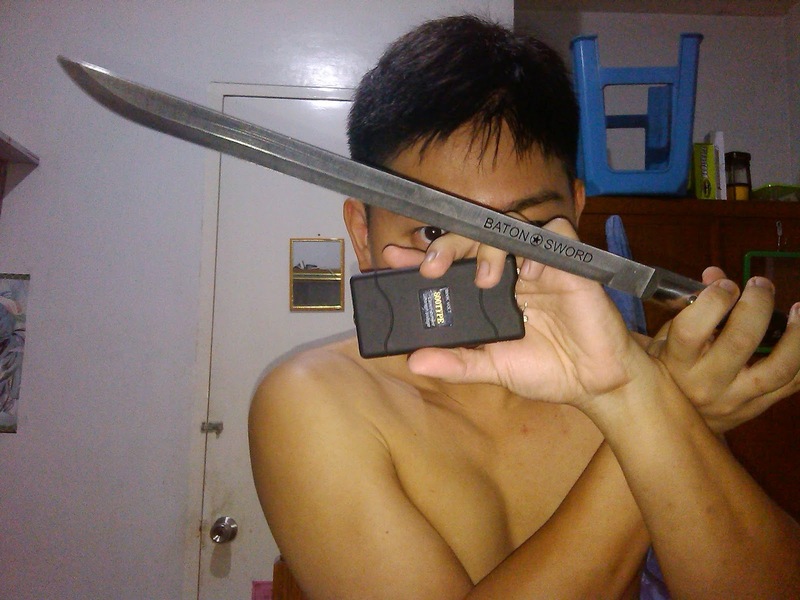 To YOU, the one reading this blog post, tell me: do you know where I got the outfit and pose from? Seriously... I thought this allusion would be easy to make out. Synopsis: Presumably outside of Mikado's estate, it seems Isumi and Athena are in on the plan as well, but they can't provide any direct support. Also, Isumi states that the place is too well-guarded even for the both of them -- and that's definitely something considering that they're two of the most powerful characters in the manga so far. 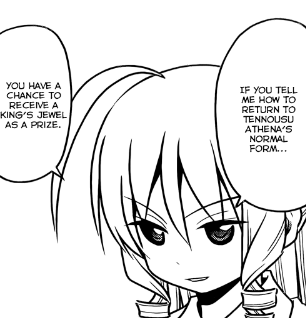 However, Athena is confident that Hayate can pull through. I'm liking the new character designs. I mean, how can I hate them when everyone looks like Nagi now? Back inside, Hayate is almost killed by a pit booby trap filled with spears. He discovers that despite Nagi taking care of the electronic locks, there are also tons of non-electronic traps inside Mikado's secret treasure vault. He checks his digital watch and discovers he's only got 45 minutes left or he won't make it out alive, so he summons Father Radiostar by dropping some gravure photo on the ground. 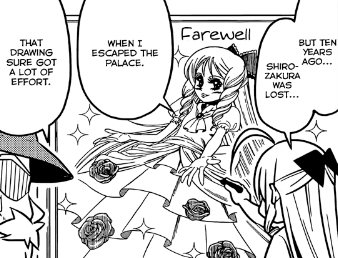 Super Mario reference makes me think he'll find a note saying: Sorry Hayate, the Jewel is in another castle. The ghost priest immediately appears in front of him and Hayate bribes him with another photo if he'd help him out by letting him borrow one of his will-o'-the-wisps as a flashlight and doing a few odd jobs for him. Hayate encounters a non-electronically locked door which needs to be opened by punching a cute looking puppy in order to get the key. Hayate hesitates and has a little banter with Father Radiostar. He resolves that he must do it for Lady Nagi's sake (because he's a lolicon and he won't admit it... yet), but while he's doing this, the puppy has now transformed into a giant humanoid rpg dungeon boss behind him with giant claws and all. He gets all fired up because now he doesn't have to hold back. Only panel of Nagi in this chapter... but she is as cute as ever! 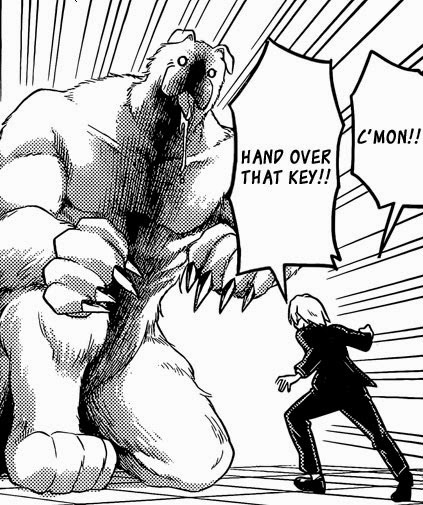 After a grueling off-screen battle, he somehow emerges victorious and manages to take the key. He and Father Radiostar now find themselves in a deathtrap room that is strangely reminiscent of a castle level from Mario. 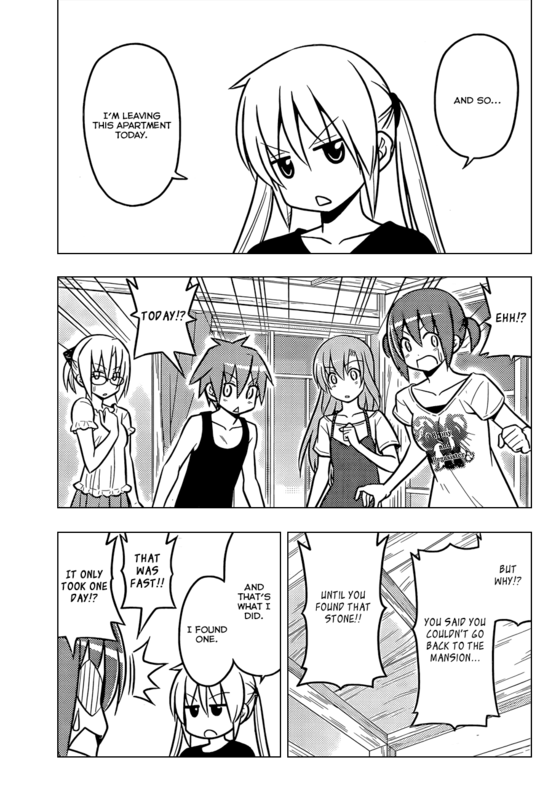 Hayate even says so: "What kind of Mario Galaxy is this?" and Father Radiostar wonders if Bowser is waiting up ahead. Fortunately, there's a room labeled "Secret Bridge Control Room" right next to them, so they enter hoping to find an easier way to beat this level. Father Radiostar warns Hayate that it's most likely a trap, but Hayate spouts all kinds of Nagi-shipping lines and goes in anyway. That face on this "puppy." LAWLZ! He finds a half-naked cutie in a swimsuit inside who is standing next to a picket sign with an arrow pointing at her saying that she is hiding the button for the secret bridge -- except there's really nowhere on her that she could possibly hide said button except in unmentionable places. The girl explains that she is Makise Konoha and that she's doing this as a part-time job and begins to feed Hayate her sob story about needing the money for her tuition and that her family is poor, her brother is sick and stuff -- totally trying to guilt-trip Hayate... and that's the end of this chapter. Synopsis: Ok, now we've got more semi-serious funny business in this chapter. This arc or mini-arc as it might turn out to be, is vaguely reminiscent of the Segawa arc wherein Hayate fought against just about everyone -- including Hatsune Miku, seriously! With that said, I am enjoying it very much. The puppy turning into that monster dog with that ridiculous drooling tongue totally had me laughing. I was also amused at Hayate's reaction and how he was all game to take on a giant monster rather than punch a cute-looking puppy. It was nice to see Father Radiostar again, as I actually kinda like his character -- even if he gets so little screentime. It was also great to see Isumi and Athena involved here as that indicates that this arc might be more "serious business" than it seems to be. Yeah... but "only as her butler." Ho... hum... find some new lines, haters. 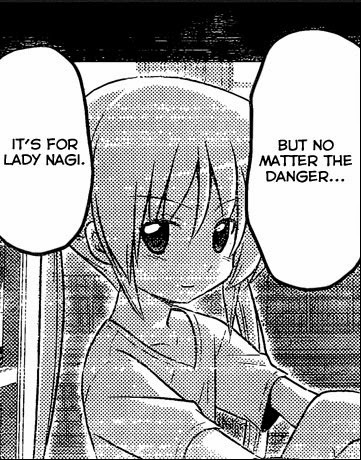 Naturally, I loved the Nagi shipping panels with Hayate mostly shipping himself with Nagi. Of course, naysayers (killjoys, actually) will keep using the "only as his master" clause for all eternity until Hata proves them wrong, so I'll just leave it at that. 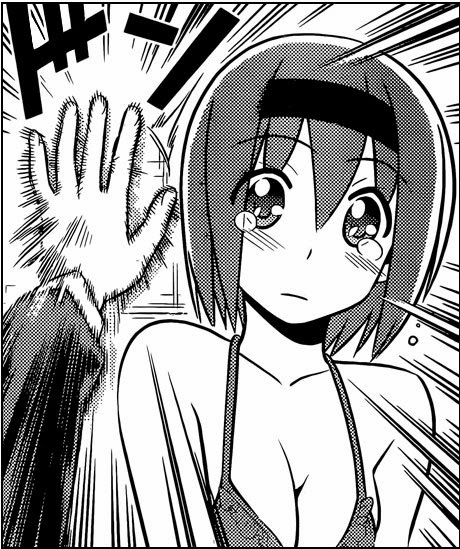 Anyway, looks like Hayate's run into some girl problems again and this time, it's a cute one and a new character! 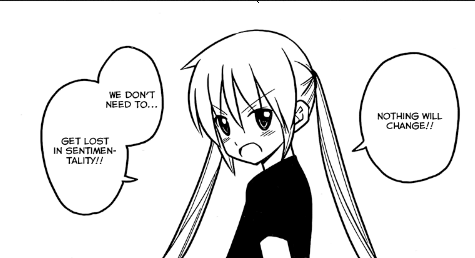 Not too sure how large of a role she'll play in the manga or if she's only a one-shot character, but it will be interesting to see how Hayate plans to find his way out of this "trap." Of course, it would be quite easy to have say Hina or even Hamster just pop up from out of nowhere to deal with this "trap." Speculation Corner: I'm calling it now: Hayate's totally on a fool's errand and the King's Jewel won't be where he's expecting it to be. 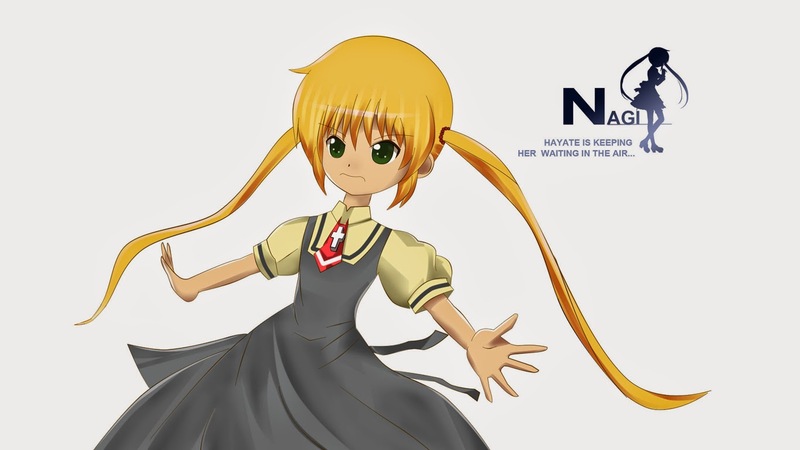 Sure, Nagi will probably still end up back with her inheritance after this arc is done, but given Hata's track record, it will probably have nothing to do with Hayate's perilous journey into Mikado's treasure vault. Anywayz, great chapter and looking forward to the next one!